A set of different kinds of pliers (see illustration below) is needed for many jobs encountered in making fishing lures. Combination pliers which have a slip joint which permits the jaws to open wide at the hinge to grip large diameters are useful for holding and bending metal. Flat nose pliers are also useful for holding or bending thin sheet metal or wire. They have a flat gripping surface between the jaws which will hold thin metal or wire firmly without damaging it too much. 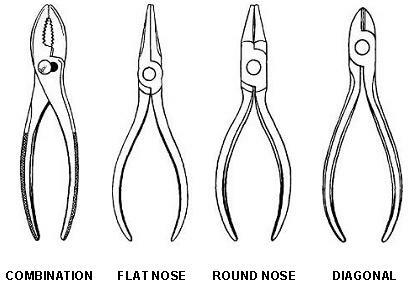 Round nose pliers are needed for bending wire into various curves and eyes. They are especially useful in making spinner shafts and wire leaders . Both jaws of these pliers are round and tapered toward the end. Curves or eyes of small radius are bent with the tips of the jaws, while those of greater radius are bent with the base of the jaws. Even so, you'll need two pairs of round nose pliers to handle most of the work. One pair can be the regular size used for heavy work, while the other pair should be the smaller jeweler size round nose pliers. These are used for making very small curves or eyes and for fine wire. Diagonal cutting pliers are used for cutting fine wire, nails, pins, and screws. The angle of the jaws on these pliers makes it possible to cut close to a surface. These pliers are designed for cutting mostly the softer metals and wire. However, they can be used for steel piano wire or stainless steel wire if they have very hard cutting jaws. Because of this you should buy the best diagonal pliers you can get. Cheap ones will not do a good cutting job, and the edges of the jaws will soon be nicked and ruined if used on hard wire.